A familiar face, a man who is always in a New York state of mind, will be performing at the Carrier Dome. During a news conference held Monday morning, concert promoter AEG Live announced that Billy Joel will appear for his seventh concert at the Dome. The concert is scheduled to take place on March 20, with tickets going on sale Dec. 6. No other musical artist has performed as many shows at the venue, with Joel’s last performance taking place in 2006. 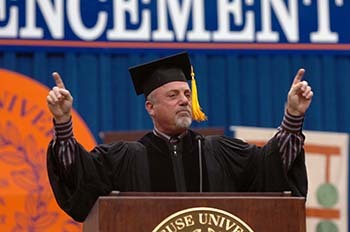 Billy Joel speaks at Syracuse University’s 2006 Commencement. “The Dome has featured many enjoyable concerts over the years. Some of the illustrious musicians that have performed here have come back to play at the Dome many times throughout the years, making ties with the community and Syracuse University that remain until this day,” said Senior Associate Athletics Director for Facility Operations and Carrier Dome Managing Director Pete Sala. Sala described Billy Joel as an “iconic performer,” before turning the podium over to Ann Clarke, dean of the College of Visual and Performing Arts, who made the formal announcement. There is history between Joel and Syracuse University. In addition to his previous appearances at the Dome, Joel was the University’s Commencement speaker in 2006. Also, the College of Visual and Performing Arts received a $320,000 gift from Joel as part of his long-term commitment to music education and his recently launched music education initiative, which provides gifts of seed money, musical scholarships and endowments to East Coast colleges. This was used to establish Billy Joel Fellowships in Composition at the Setnor School of Music.